Cattier Organic Shampoo with Yoghurt Extract, with its light texture and soft, delicate foaming action gives shine, softness and suppleness to all types of hair. Its ultra-gentle, pH balanced formula means that it is suitable for frequent use. Rich in Wheat Protein, a composition which is very similar to the keratin proteins in hair, Cattier Organic Shampoo with Yoghurt Extract nourishes and strengthens the hair at its very roots, leaving it easier to comb out. Essential oils And Organic Lavender Flower Water, selected with the utmost care, have been added to enhance its cleansing properties and to leave the hair lightly fragranced. HOW TO MAKE YOGURT SHAMPOO ? 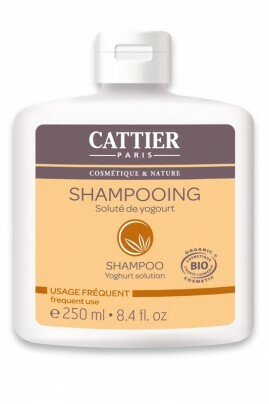 Apply Cattier Organic Shampoo with Yoghurt Extract to wet hair and gently massage in, produce lather. Leave for a few moments, and then rinse thoroughly with warm water. Yoghurt Extract, Organic Aloe Vera, Wheat proteins, Glycerin (vegetable), Plant Vinegar (Lavander, Rosmary, Sage, Thyme), Essential oil of Lavandin and Sage.